If you are a swimmer with a disability who has not considered taking part in competitive swimming, why not start now? Swimming is also a great way to have fun, keep fit and learn new skills! We offer ‘Learn to Swim’ and ‘Improver’ classes through the Runnymede Swim School. 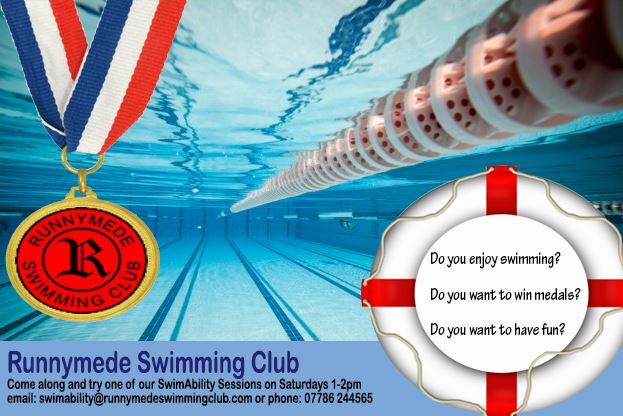 Swimmers who want to progress to competitive swimming then move into the most suitable Runnymede Swimming Club Squad. We provide an inclusive environment for swimmers with disabilities to train alongside the mainstream squads and take part in the club’s social activities. We also offer competitive opportunities and provide information and support on swimming competitively at disability galas/para-swimming. All swimmers of the SwimAbility Squads take part in disability galas around the region and throughout England. In addition, SwimAbility Squad members compete in mainstream galas where appropriate to their times. Runnymede Swimming Club operates in accordance with the ASA Child Protection and Equal Opportunities Policies. It also operates a Code of Conduct for all its members and personnel. Classification is the grouping of swimmers with like ability to ensure that there is a fair playing field. Classification is vital for those swimmers wishing to pursue a pathway in competitive swimming. Each impairment group has a different range of numbers that is summarised in the table below, each number is given a prefix. S denotes the class for Freestyle, Backstroke and Butterfly events. SB denotes the class for breaststroke events and SM denotes individual medley. There are different processes for classification for different disability groups. Watch this video to find out how physical classifications are carried out. Classification provides a structure for competition. Athletes competing in Paralympic sports have an impairment that leads to a competitive disadvantage in sport. Consequently, a system has to be put in place to minimise the impact of impairments on sport performance and to ensure the success of an athlete is determined by skill, fitness, power, endurance, tactical ability and mental focus. This system is called classification. To be classified with a physical impairment, a swimmer’s functional mobility is assessed by World Para Swimming trained classifiers. The process involves a physical test, technical test and observation in competition, during which time a swimmer’s classification will be determined along with the identified stroke exceptions applicable to the individual. A minimum of two classifiers form a classification panel consisting of a medical classifier (a doctor or physiotherapist), who will have undertaken the British Para-Swimming classifier training, and a technical classifier (a swimming coach). Click here to e-mail us for more information on how to become a classifier. In the first instance, swimmers will need to obtain a British Swimming classification and then as they progress along the elite pathway may be put forward for an international classification. Swimmers with a visual impairment range from blind to visually impaired. When testing is undertaken, the classification is allocated based upon sight in best eye with best correction. Sight classifications are processed by British Blind Sport. Swimmers with an intellectual impairment have to meet the eligibility criteria. There are two levels of II classification in GBR: UKSA and Inas.